Please select options for Steeda X2 Ball Joint Kit (94-04 All) at the top of this page. Hey, guys. 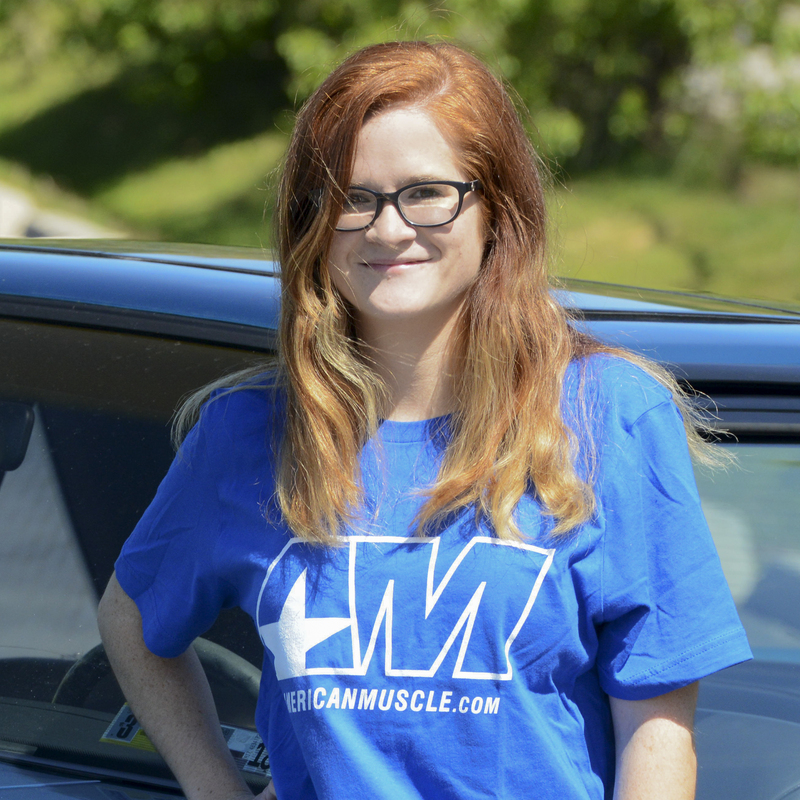 Stephanie with americanmuscle.com, here with a review of the Steeda X2 Ball Joints for 1994 to 2004 Mustangs. These ball joints are gonna be a deal for lowered Mustang owners that aren't just looking for a replacement ball joint, but one that's gonna help the suspension geometry, and that don't mind paying extra for that benefit. You're looking at spending about $50 a piece for replacement ball joints, and this kit of 2 ball joints will cost about $40 more. But you are getting another benefit here, other than just new components. The X2 Ball Joint has a longer shaft, and this is gonna raise the spindle in relation to the ball joint pivot point. This means that the roll center will be raised back to the correct range. When you lower your car, you change the geometry of a lot of components in the suspension, and ball joint being one of the items that are affected. The longer shaft on these ball joints will correct the geometry so that the ball joint is in a better position and will be able to function better. That means it'll reduce body roll and give you quicker steering response.These ball joints can really tie off a car with a set of lowering springs and other suspension mods. They're gonna help you get the most out of your other suspension mods, and they'll help you with tire wear, too. These, when paired with a Steeda Bump Steer Kit, will also eliminate all of your bump steer issues. One thing to keep in mind here with these ball joints is that, if you have a set of caster camber plates installed on your car and you want these ball joints, it's highly recommended to also add a bump steer kit, like the Steeda or BBK kits. This is due to the geometry of the suspension, and having an adjustable tie rod end or a bump steer kit will help with the steering arm. The ball joints do come with spacers, which are used to keep the X2 Ball Joint at the same ride height as the stock ball joint, but just with that better roll center height, thanks to the design of the X2 Ball Joint. The spacers are optional to use, and without them, they're gonna lower the front of the car about half an inch. If you use the spacers, they'll raise the front of the car back up one-half inch to the original height of the stock ball joint. This isn't gonna change the ride height at all, but just the suspension geometry. These ball joints will fit the '94 to '04 Mustangs, so the V6, the GT, the Bullet, the Mach 1, and the SVT as well. But I wanted to say that those Fox bodies out there with 5-lug swaps that use '94 to '04 spindles and brakes can use these ball joints as well. They won't fit the 4-lug Fox bodies, because they're gonna interfere with the rotor and the control arm, but if you have a Fox that's 5-lug swapped and you're using '94 to '04 spindles and brakes, these will work for you as well.When it comes to price, you can expect to pay just below the $150 mark for these ball joints. For a normal replacement ball joint, you're looking at about $100 total for both sides, so this is about $40 more. And you're not only getting a new ball joint, but you're getting one that'll also help with the geometry of a lowered car and designed to take more abuse than the stock ball joint.As far as the install goes, you're looking at a little bit of work here, and you can expect to spend a couple of hours in the garage. It's gonna be a two out of three wrenches on the difficulty meter, and you will need a few tools and some knowledge to complete the install. You're looking at needing to get the front end of the car in the air to remove the wheels, and the front brakes, and the end links. The spindle will need to be disconnected from the strut and ball joint, and then the old ball joints can be pressed out. If you have the right tool, you can leave the control arms on the car to press out the old ball joints and press in the new ones. If you don't, you're looking at needing to remove the control arm to do this. If you're gonna use the spacers, your springs will need to be removed so you can place the spacers into place. The spacers will be installed on top of the springs. Next, you'll install the grease fitting on the bottom of the new ball joints and reassemble the suspension. As always, an alignment after the install here is a good idea.Wrapping things up here with the Steeda X2 Ball Joint Kit, these ball joints are specifically designed for lowered cars. They have a longer shaft that's gonna raise the spindle and give the ball joints a much better pivot point. As always, you can check them out more online right here at americanmuscle.com. Designed For Optimum Handling. Steeda's X2 Ball Joint will greatly improve the suspension geometry on your lowered Mustang by raising the spindle relative to the pivot-point of the ball joint. This raises the roll center back into the correct range, resulting in reduced body roll, quicker steering response and improved overall front tire grip. Tested In Extreme Conditions. The X2 ball joints are made in the USA to Steeda's strict specifications by a respected name-brand supplier to Ford, GM, and Chrysler. Except for their unique custom length, these ball joints are constructed from the the same OEM materials that have been extensively tested in Ford police cars and other heavy duty service vehicles, where they have far exceeded the durability of current production "stock" ball joints. Eliminates Body Roll. The X2 ball joint was specifically designed to correct the front roll center geometry. The X2 ball joint features a longer shaft, to raise the spindle in relation to the ball joint pivot point. Springs spacers are included in the X2 kit to maintain the same ride height as the stock ball joint, but with an improved roll center height. Application. This set of two Steeda X2 ball joints are designed to fit the 1994 to 2004 Mustangs including V6, GT, Bullitt, Mach 1, and SVT Cobra. They will also fit 1987-1993 Mustangs that have been converted to a 5 lug setup using 1994-2004 5 lug spindles and brakes. Technical Note: These Steeda ball joints do not fit stock 4 lug 1987-1993 Mustang brakes because of interference between the rotor and the repositioned control arm. Do I need a bump steer kit with these? My car is lowered. A bumpsteer kit is not required to be used with a lowering kit or these ball joints, however, it is highly recommended to get one as they can help with the issue of "ghost steering" when going over bumps when the car loses traction. Do these require alignment? I just bought these ball joints and lowering springs . After I install them do I need to get an alignment? Yes, you will always need an alignment after springs or a major change like this. After disassembling the front suspension as much as you will need to in order to install this part, an alignment is recommended. YES you do. These balljoints (GREAT product FYI) raise your spindle/roll point. Are spacers included? My 04 GT is already lowered 1.75-2" in the front and if it lowers anymore I will run it into the ground. I am replacing the shocks/struts, camber plates, and a bumpsteer kit. I just want to know if I get these, will they have spacers so it does not lower it anymore and if I even need these. Thanks guys! Metal spacers are included to compensate for the additional drop to the a-arms which are not a bottoming concern in this application. They go up top of the spring. No noise has come from them in my car. I notice the same ride height I had before the ball joints were installed and had the same concerns as you. Given the mods you have, and what you plan to do, you need these to get the most out of the rest of them and retain proper suspension geometry. Do it right once. Yes. When you install these ball joints, you may opt to install the provided metal spacers on top of your springs to prevent lowering the car any further and to help correct the front suspension geometry. They will fit. Product description confirms this, and the front suspension geometry in all mustangs of that year range is the same. Yes, I am running 17x9 fronts and they fit with no problem. Yes, they fit with room to spare. I have 17" Bullitts on mine. Yes. There will be absolutely no difference with wheel clearance with these ball joints compared to the factory ball joints. We have not attempted to install Steeda Ball Joints into the BMR control arms. We would recommend contacting BMR directly to ensure these would be compatible with the control arms and your individual build. We would recommend having the Steeda covers installed with this product. Unfortunately, we do not carry the covers separately but you may be able to get them directly through Steeda. The spring spacers included in the Steeda X2 Ball Joint Kit will install on top of the isolator. OEM replacements will work just fine, but these Steeda ball joints will be stronger, help keep your friend more stable, and last longer than any stock ball joint would. No, I did not remove the dust shield when I did mine. Just take care not to bend/distort them when separating the spindle from the factory ball joint. You def can keep the shields on!!! These ball joints are better quality than off the shelf OEM replacements. The real benefit comes in if the car is lowered, however, they still work perfectly fine with cars with factory springs. Just do not use the aluminum spacer the kit comes with as you do not need to correct camber. If your pony's suspension hasn't been modified keep the factory ball joints. These ball joints are taller to help adjust the toe of the front tires. If you install these with factory suspension it will set your alignment off. You'll go through some tires really quick! yes, the SN95 chassis platform is the mustang years ranging from 94 to 04, some refer to the 99-04 mustangs as "new edge" mustangs but they are still typified as SN95 chassis. these should give you no problem in fitment. Here's my experience with Steeda X2 Ball Joints... The construction of these Ball Joints feel heavy duty but the grease fitting feel aluminum. Installation of the Spring spacer and Ball joint was easy but as I installed the grease fitting it broke, half of the fitting was still inside the Ball joint. I didn't over tighten it because it only screwed in halfway. I called Steeda and their expert advise was to drill out the broken fitting. I eventually got the broken grease fitting out, bought new ones and install it. The Nuts that comes with the kit were misshapen, almost oval shaped. I tried installing it on top of the Ball joint but it wouldn't screw on, the Ball joint just spun around. I tried using another tool to hold the Ball joint but it didn't work. I greased the Ball joints and hit the road. Fast forward 3 months later, the driver's side Ball joint started making creaking/popping noises. I grease them again and the noises went away. Fast forward another 2 or 3 months, yep.... more creaking/popping noises again. So far I've greased the driver's side Ball joints 4 times since I've had them and now the passenger side is starting to creak/pop. My Mustang is a daily driver, I don't race or cut corners at high speeds so I'm not sure if I just received bad Ball joints. I'm currently looking to buy a different brand. These ball joints are the way to go. You can immediately realize the difference in quality compared to the parts store brand and not using the optional coil spring spacers made for a lower front end and best of all, they're greasable. These are a must for lowered mustangs! Smoother ride then ever ! Way better then stock, must have in these old cars. I used these in a set of UPR tubular A-arms, works great. Quiet and smooth. You can definitely feel the difference on how much better the car handles especially if you get a bump steer kit to go along, it’s the perfect combination!!!! The ball joints are perfect for a lowered car. The biggest pro for me was being able to grease the ball joints rather than pre-packed. The quality of the parts looks/feels great. I would recommend a mechanic shop to install to ensure that alignment of the tires are spot on. High quality product. No more popping now. Actually dropped the front end just a tad lower than the factory ball joints. The instructions are great but the make the project longer than it was originally thought mostly due to the addition of spacers and cutting/removal of the dust plate. I had to put a tone of lube in them because they made a horrible clanking noise on every acceleration and breaking. But it has gone away now with the grease. After installing these, no more rubbing or rolling noise. I am very happy with this purchase. Install was very easy and i can definitely feel the difference in handling compared to the stock ones i had. They feel great and made the front sit a little lower now. Put this in when I overhauled my suspension. Went to SR coilovers with bbk bump steer, new arm bushings, tubular rears. Easy to press my old ones out and put these in. There seems to be confusion as to if you need to use the Coil Spring spacers or not. Otherwise, do not over grease! the boots pop off and are somewhat of a pain to get back on. Would highly recommend. 4.5 would settle this. I mean, it is what it is, STEEDA. Name and reputation says enough. Only time will tell If they hold up to my abuse. Car is a weekend joy ride if it’s nice out. All parts where there. I did not use the provided coil spacers. Dropped the (front)car 1/2”. Two joints, zerks, nuts, spacers. Only issue I had,,,, both provided NUTS where NOT threaded completely. They stopped flush with the top of joints. I had to do some work, but I threaded them myself (without a tap, mine was too small). This alone took the most time. I call AM the next day and advised them of the issue, they wanted to send me two other nuts, but I turned them down cause these ain’t coming out until they break. The issue lyes with Steeda production, not AM. Overall,,,, satisfied. No more popping and sqeeking when I turn the wheel, wheel now returns after a tight turn. I said a lot. Thx AM.